Plot Summary: The anime once again tells two stories. The first story takes place in the past. Himura Yuu meets a girl, Amamiya Yuuko who seems to know him, but he doesn't know her. However, he soon remembers that she was a girl whom he knew from long ago. Yuuko then tells him something which he never knew. He was her first love since then, and her first love has not ended yet. 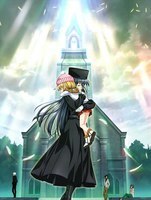 The second story takes place in the present, just after the events of ef - A Tale of Memories. Shuuichi Kuze meets the cousin of Aso Renji, Hayama Mizuki and spends a lot of time with her. Unknown to Mizuki, Kuze had contracted a fatal illness and has little time left to live. Kuze had decided to break all romantic ties, but things go bad when Mizuki tells him that she loves him.